Humanely harvested and locally processed wool derived from Navajo Churro sheep managed through practices verified to enhance water, soil, and climate. In partnership with our regional fibershed, Mountains & Plains Fibershed, and our local Natural Resource Conservation Service office, a carbon plan is currently being drawn up for our farm, carbon farming practices, which can be measured and monitored for the enhancement of permanent soil carbon storage, are being implemented on the farm, and therefore material coming from our farm can be verified as Climate Beneficial™. Uploaded by Fibershed California on 2017-10-23. Inner coat: Wool fibers range from 10- 35 microns, comprising 80% of the entire fleece, measuring 3 - 5 inches in length. Outer coat: Hair fibers measuring 35+ microns, comprising 10- 20% of the entire fleece, measuring 6 to 12 inches. The fleece has no defined crimp. Unwashed, lightly skirted, raw fleece. A variety of colors. Ideal for hand spinners as there is vegetable matter in the wool. Tapetes de Lana, Mora Mill, Mora, NM (nonprofit mini-mill) spun strong classic Dine' (Navajo) weaving yarn. -- single-ply "classic" Navajo-Churro weaving warp. This mini-mill has a unique and special ability -- the knowledge to understand and produce highest-quality machine-spun yarn from long-staple premium Navajo-Churro fleece. Yield has run so far at about 65%-70% from the raw fleece. *Note: all efforts are made to keep the fleece clean, but inevitably, due to the nature of our dry landscapes and our sheep’s natural behavior, there is vegetable matter in the fiber. Tapetes de Lana, Mora Mill, Mora, NM (nonprofit mini-mill) spun strong classic Dine' (Navajo) weaving warp. -- 2-ply "classic" Navajo-Churro weaving warp. Approx. 864 yards per pound (ypp) @ $3.805/oz. 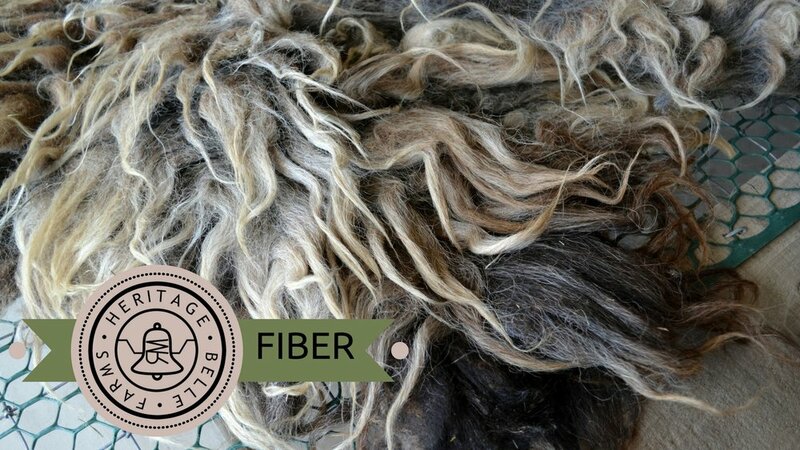 To purchase raw fleece, please contact us at HeritageBelleFarms@gmail.com to set up an appointment for you to come take a look at our inventory. We are in the process of inventorying our raw fleece and will post individual fleeces for sale as they become available above ↑. Once farmers market season starts, for yarn and warp, you can visit our booth at the Colorado Farm & Art Market every Wednesday from 3pm-7pm hosted by the Colorado Springs Pioneer Museum, or visit our booth at the Colorado Farm & Art Market every other Saturday from 9am-1pm, hosted by the Margarita at Pine Creek. Please be sure to check our event calendar to double check the Saturdays that we will be at the CFAM. We are able to ship our yarn, warp and raw fleece at an additional cost. We also sell wholesale, contact us if you are interested in carrying our products in your store. We are able to ship all our fiber products at an additional cost.